Next day, short track. 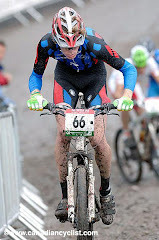 It was a lot better than the xc and was my highest placed pro race yet. I placed 27th and i felt pretty good about it so it was good. 2 people crashed right in front of me at the same place so the second time someone crashed, i got mad. and so i dropped the group i was with on the last lap. Now i'm back in boulder.